Kano Model usages come in handy when Six Sigma projects focus on the customer to achieve total quality and satisfaction. iSixSigma recommends utilizing a Quality-Function-Deployment (QFD) process first and charting the data using a Kano analysis. Dr. Noriaki Kano, famous for his writings on Total Quality Management (TQM), created the Kano Model to go hand-in-hand with Six Sigma projects that must rely on the end-user's desires, wants, needs and the unexpected bonus. 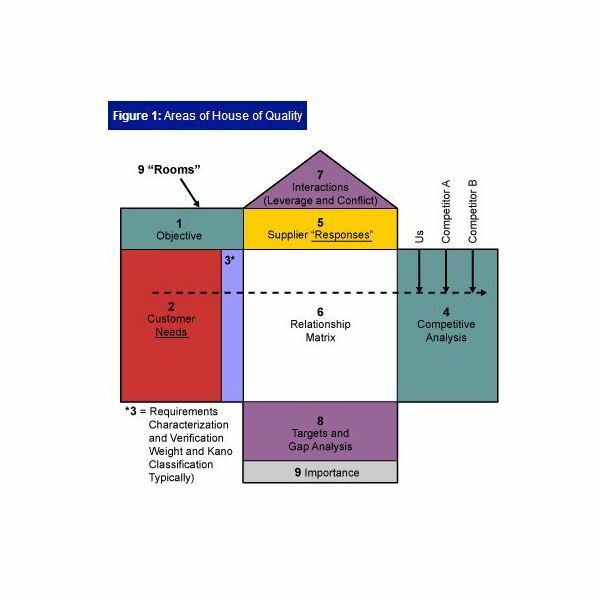 In the screenshot to the left, you can see an example of a House of Quality (HOQ) that first helps Six Sigma teams streamline the product by looking at customers, competitors and other factors that will ensure a product’s success. An HOQ is the first stage in using the Quality-Function-Deployment model. In essence, the QFD process is a Six Sigma quality/limit defects tool that enables Six Sigma teams to develop and deploy the product to the end user or customer. From there, Six Sigma project managers will analyze the product and Kano Model usage is key in finding out how satisfied both the customer and the project stakeholders are with the product’s outcome. A Kano Model essentially comes into play once the product is on the market, looks at ways to improve the product while keeping the customer’s desires in mind—or reaching total customer satisfaction to gain repeat and loyal customers. In the screenshot to the right (click to enlarge), is an example of a Kano Model that is basically an x-y chart. The x axis reveals through data charting how well the project team is achieving customer satisfaction and the y axis charts the opinions of the actual end-user or customer. Satisfaction – How satisfied are both the consumer and the project team on the product's quality? Dissatisfaction – How dissatisified are the end user and the Six Sigma team on the product's quality? Requirements Fulfilled – Did the product fulfill both stakeholder and end-user needs? Requirements Unfulfilled – Are customers or stakeholders unhappy with the expected requirements? Of course, Six Sigma analyzers want top satisfaction and fulfilled requirements to be at high levels or they must go back and find out what went wrong with the product. Often, through analyzing charted and proven data, the project team can decide to improve upon the producct, squash the product, or start all over again. 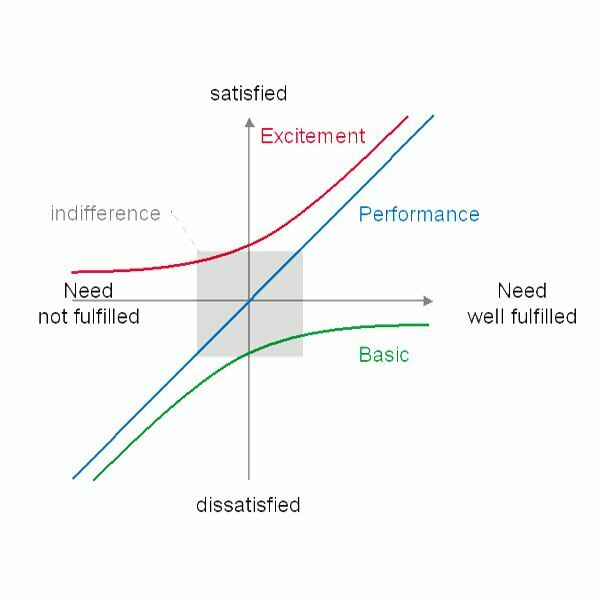 With the rage of the one-cup coffeemaker, let’s use this product in our Kano Model example, keeping in mind that in a Kano Model, there are three elements that must be present to analyze data, based on customer surveys. Must Be – Quality and availability of the actual product. Performance – How well you meet the needs of the customer. Delighter – Offering up the unexpected (or bonuses) to the customer. Must Be – If the customer walks into a retailer that advertises they sell the new coffeemaker but have none on hand to sell, this blows away the element of the must be—or the required element on our Kano Model. A customer who could not even find the one-cup coffeemaker would rate his or her level of requirements very low on the Kano Model scale. If the coffeemaker is on hand to sell, the must be element (requirement) has been met. Performance – Once the coffeemaker is placed into use, the customer can evaluate its promised performance. If the coffeemaker won’t turn on or spits out coffee and grinds into the cup, the customer would rate the product high on the dissatisfied scale. On the other hand, if the coffee is finished fast and is quickly ready to drink, the customer would rate satisfaction levels high. Delighter – The delighter is something a customer doesn’t expect to gain by purchasing the one-cup coffeemaker. For example, our coffeemaker may say it comes with one box of prepared coffee so the customer can utilize the coffeemaker immediately. If, however, the coffeemaker offers the bonus of not only the six free coffee products but also receives a special filter where they can utilize their own coffee grinds, this is unexpected and the customer is delighted with this feature. If the product requires the customer to purchase a filter separately, the delighter would be missed. By charting the data of the one-cup coffeemaker, project teams using Six Sigma can easily identify where the product failed and why and take the necessary steps to improve the product based on the Kano Model usage and data outcomes. If the product scores high on all levels of the Kano Model, the project team can then monitor the Kano data to ensure the product continues to please the end user. This very simple example of a Kano Model in Six Sigma projects can be implemented in almost any type of product or service where the Six Sigma Methodology is utilized.